As part of the design competition for the new O’Hare Global Terminal, Atelier Ten teamed with Skidmore, Owings & Merrill LLP (SOM) to develop a sustainable vision for the new terminal that improves the passenger experience and enhances airport operations. Inspired by O’Hare’s history as “Orchard Field,” the new Global Terminal is defined by light-filled spaces and amenities that reflect Chicago’s cultural heritage and vision for the future. 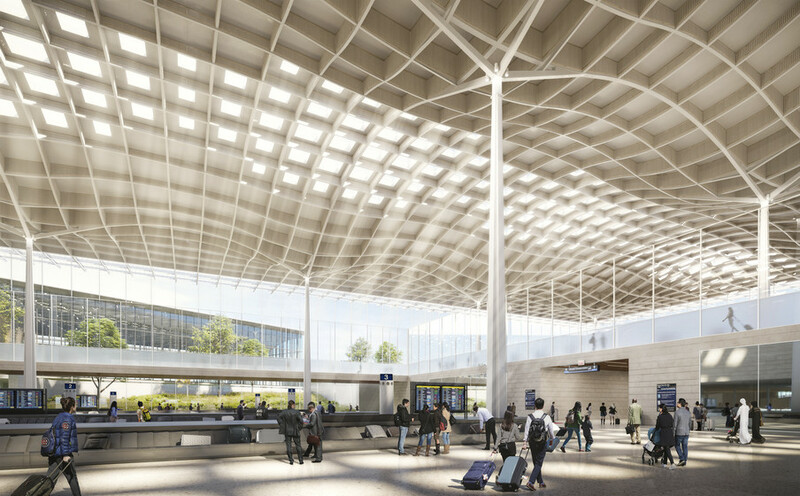 By designing a soaring, double-height concourse, the terminal is filled with daylight and improves the passenger experience with clearer sight lines and views of Chicago. Atelier Ten provided daylight analysis to create a well daylit space and provided recommendations to optimize the roof design to mitigate over illuminance from the skylights. The skylights deliver an even, diffused light throughout the concourse, reducing the building’s environmental footprint. To read more about the design, visit SOM’s website.